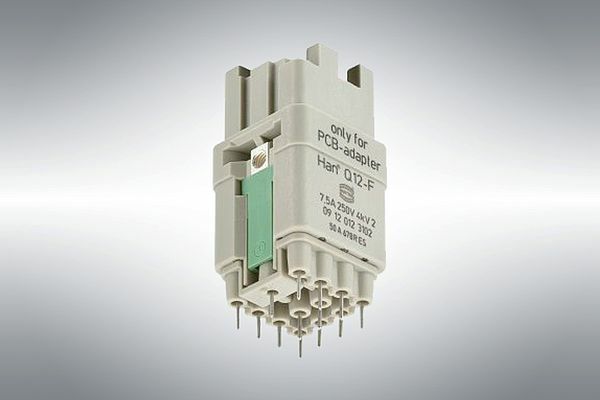 Allowing direct connection to device boards, the Han Q 12/0 PCB adapter from Harting offers 7.5 A braking current, 250 V rated voltage and 4kV rated impulse voltage at pollution degree 3. In addition to the PCB adapter, special versions of the connector’s male and female inserts for the adapter will be available. The PCB adapter's installation is independent of the connector; it can be pre-installed according to the pinhole pattern on the board, as with other passive elements. The male or female insert for the PCB adapter is installed after the board has been installed in the housing by being mounted on to the PCB and fixed in place on the bulkhead-mounted housing with the fixing screw. Due to the separate connector for the PCB adapter, all 12 contacts and the PE conductor can be used. Consequently 12 contacts plus PE are available for the connection to the PCB, with technical parameters in accordance with DIN EN 61984.